Fenley Office Suites executive boardroom and large conference room provide the perfect full service space for your next meeting or event in Louisville. Whether you need space for a personal one on one meeting or for a 50 person event our meeting solutions offer a complete package of services. Offering complete meeting solutions including technical and catering support, we are here to handle all the logistics of your meeting room needs allowing you to focus on your event and your clients. Our executive boardroom and professional conference rooms offer distinct unique advantages over other meeting space for busy professionals or meeting planners organizing large and small events. With flexible terms we enable you to host one day meetings, one hour meetings, evening events or overnight conferences. 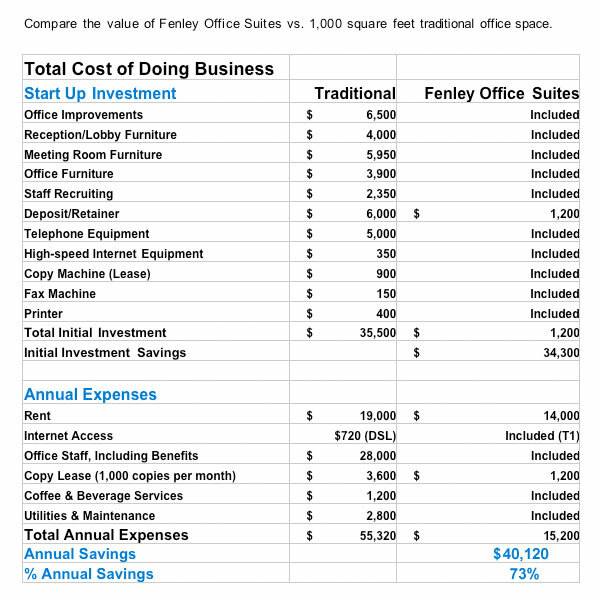 The latest technology has been built into our Louisville meeting room facilities allowing Fenley Office Suites to offer state-of-the-art connectivity and services. Since our meeting room solutions were created to support our clients they are more affordable than traditional meeting facilities. Our Office Support Solutions offer you the flexibility of only paying for the services you need, when you need them. We allow you to have your own professional assistant without the expense and difficulty of a full or part time employee.